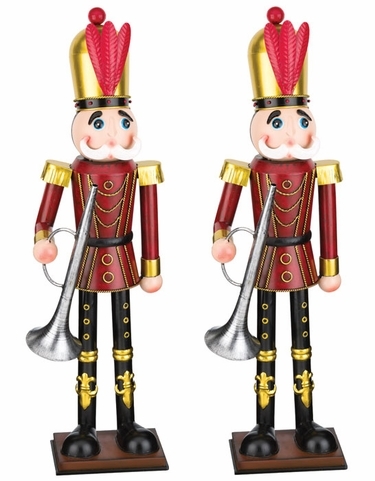 Our Large Metal Christmas Toy Soldiers are so spectacular we just couldn't wait to get them up on the site. A fantastic piece of Garden Art to bring whimsical holiday happiness to any home and garden. At 30 inches feet tall this remarkable garden statue will stand out and surprise all the kids. Bring the magic of Christmas to life with this nutcracker style 30" Toy Soldier wearing a classic red jacket and holding his holidy horn. Featuring impressive craftsmanship with meticulous attention to detail and unique finish. All metal in design and hand painted for extra long durability. Showcase multiple colors and sizes together for a spectacular display! Classic, joyful and traditional.